Bell peppers, sometimes called sweet peppers, thrive in many home gardens. 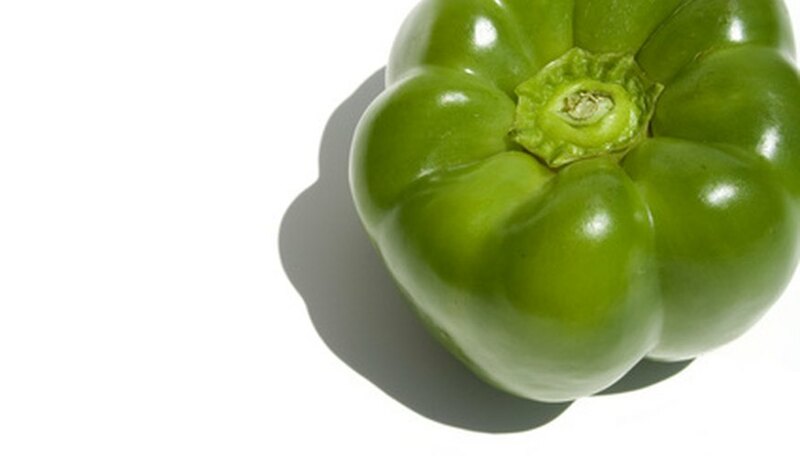 These warm-season vegetables produce both green immature peppers and yellow or red mature peppers for use in the kitchen from mid-summer until the first fall frost. Proper watering is vital if bell pepper plants are to thrive. Too much water can drown the roots, causing the plant to die. Too little water places the plant under stress, preventing it from producing an abundant harvest of full-sized fruits. Prepare the bed prior to transplanting the bell peppers to ensure that the soil drains correctly and doesn't become waterlogged. Lay a 2 to 4 inch layer of compost over the entire bed, then till it in to the top 8 to 10 inches of the soil to aid drainage as well as add additional nutrients. Lay a 2 inch layer of mulch over the entire garden to preserve soil moisture. Alternately, cover the bed in a black plastic mulch prior to planting the peppers. Water peppers at least once a week, providing enough water to thoroughly moisten the soil without making it soggy. Water more often during hot, dry periods if the soil is beginning to dry out. Fill containers with a soil-less potting mix prior to planting the bell peppers. Soil-less mixes drain better, and do not compact around and damage the pepper's roots after watering. Water the containers from the top when the soil surface just begins to dry. Water until the excess moisture begins draining from the bottom of the bottom. This ensures that the potting mix is evenly moist throughout the bottom of the pot where the pepper roots are. Check the moisture in the containers at least once a day, and water as needed. Peppers in containers may require twice daily watering during hot, dry periods. Water plants early in the day. This ensures that the leaves dry before nightfall, which prevents fungal diseases. It is vital that the soil does not dry out when the pepper plants are blooming. If the soil dries out the pepper may drop its blossoms and fail to set fruit.